At any point where a differential pressure has to be indicated locally, and, at the same time, a signal is wanted to be transmitted to a central controller or remote control room, the model DPGT43 intelliGAUGE can be used. An additional measuring point for mechanical pressure indication can thus be saved. The model DPGT43 is based upon a model 732.51 highquality, stainless steel pressure gauge with a nominal size of 100 or 160. 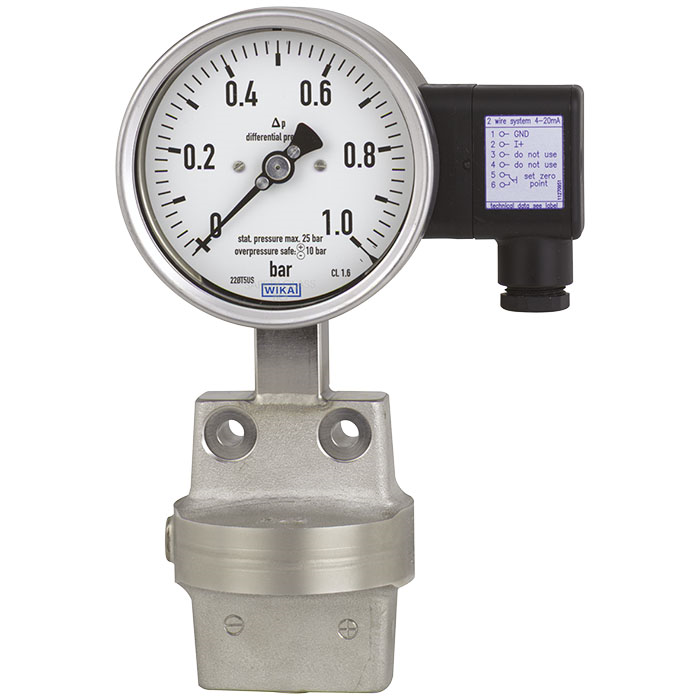 The pressure gauge is manufactured in accordance with EN 837-3.
sealing elements are required, so that a better long-term leak tightness is ensured. A high overload safety is achieved by the all-metal construction and the close-fitting design of the pressure element. The electronic WIKA sensor, integrated into the high-quality mechanical differential pressure gauge, combines the advantages of electrical signal transmission with the advantages of a local mechanical display. The measuring span (electrical output signal) is adjusted automatically along with the mechanical display, i.e. the scale over the full display range corresponds to 4 ... 20 mA. The electrical zero point can also be set manually.